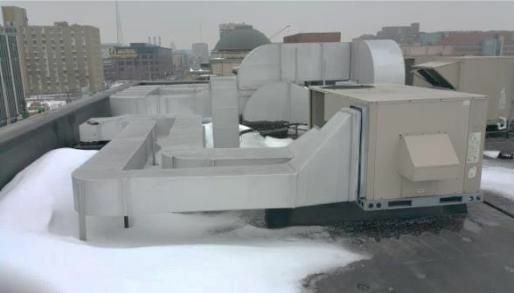 Often, it is necessary to route air from HVAC systems on the roof of a building. This occurs when the ductwork may be too large for the existing ceiling heights or when new HVAC equipment will be added to an existing building. Often, ductwork is routed on the exterior wall of a building so it can be elevated above a usable ceiling height or to provide a unique interior. The fact is…most people don’t distinguish the differences in outdoor ducting systems and why focusing on different ducting systems can be so important to energy savings. Not actually seeing this energy escaping…is likely why it is given little attention. Evidence from no snow on the top and around the duct proves that this is an issue…and where attention is needed. The energy savings leaders at Thermaduct recognized the growing demand from owners for energy efficiency. Managing a building HVAC system’s energy use offers a number of challenges including the HVAC equipment itself, the system control and the “grid” or distribution of that energy. 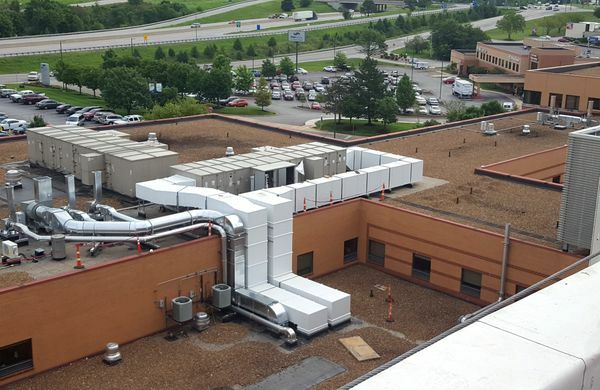 All combined, a building employing outdoor ductwork can save thousands of dollars per year in energy costs. Using the nation’s electrical energy companies as an example, you could say that the power generation (the source of energy) can be compared to the HVAC equipment, the control and switching of that power likened to the energy management system and the electrical grid likened to the duct system. No different than the electrical grid is to a power company…the ductwork is the “grid” that distributes the energy from your HVAC system throughout your building. When an energy grid has losses, the required amount of generated energy needed increases. For example, an average home requires 10,900 KWh annually…and the energy grid that supplies power loses 6%. The obvious result is a 6% increase in electrical energy generation capacity needed to provide required power to that home. When an HVAC system supplies energy in the form of “conditioned air”, these losses in energy from the grid that supplies this energy (the ductwork) can be invisible…yet substantial. Thermal conductivity of the air distribution material. The increase in blower horsepower required to deliver necessary air/energy to make up for air leakage. 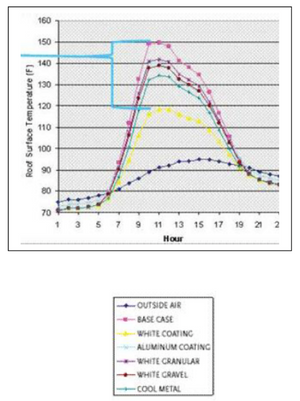 "At peak temperatures, a white roof is 20 degrees cooler than a roof with an aluminum coating and 30 degrees F cooler than a roof with a dark coating." Thermal conductivity is an easy calculation because it simply considers the differences in temperature between the conditioned air inside the duct vs. the influence of the ambient temperatures outside the duct. This energy consumption is a sensible heat calculation that is U-factor x difference in temperature x the surface area of the duct. This calculation is effected by “solar” radiant heat in the summer as the sun can raise the temperature of a surface as much as 30 degrees F.
Designed into the HVAC energy grid (your ductwork) has an allowable duct leakage rate that is included in the SMACNA duct construction manual and is characterized by a “leakage classification”. For example, a SMACNA leakage class of 24 equates to 24 CFM per 100 square feet of ductwork. A “very good” duct system will provide a duct leakage classification of SMACNA Class 6 weighing in at 6 CFM per 100 square feet of duct. Thermaduct can reduce this to less than 1 CFM per 100 square foot of ductwork. The energy calculations from duct losses include the sensible and latent energy costs. Blower horsepower parallels the wattage required to deliver the needed quantity of conditioned air to the appropriate location. When duct leakage occurs, not only have you lost the energy you paid to condition the air being lost in the first place, you increase the power required to deliver the remaining energy to the location where it is needed. Because fan laws demonstrate that a 5% increase in airflow might represent a 10% increase in horsepower, energy from the increased wattage needed to deliver air can be significant. If you consider the thermal values of the typical duct system, add in energy lost from duct air leakage and the energy from the increase in motor horsepower required to make up for duct losses, the result is up to 40% in energy that is lost from the HVAC system. (source; University of Florida IFAS Extension) Consider if the electrical power companies power distribution grid had losses of 40%, the country would address it as a national crisis. Thermaduct can reduce the cost of duct loss by over 70%. The savings in most installations is not measured in hundreds of dollars annually… most often it is in thousands of dollars. Thermaduct starts out as KoolDuct, a high efficiency UL181 Listed foam panel and adds a heavy 1000 micron UV stable, IR reflective factory applied titanium infused vinyl laminate barrier on the external surfaces of the duct panel. All seams are either chemically or thermally welded and are not dependent on tape and adhesives. Thermaduct is backed by a 10 year limited warranty and some of the best support in the industry. The extra measure insures that we can deliver the performance of the product you are paying for now…and into the future. Some companies have promises, Thermaduct has results. Hundreds of successful installation across the United States prove the benefit of Thermaduct…saving thousands of tons of CO emissions annually.